Following the demise of the Soviet Union, the Anglo-American/NATO Imperial Project (AANIP) was on a high through the early 1990′s; but as the decade progressed, expectations of a much vaunted - but elusive - ‘peace dividend’ put increasing pressure on a fundamental need to crank up its global military capabilities if well-laid plans were to be realised. The communist threat was no more and as the decade progressed, the need for a new enemy became pressing; preferably a really evil scary omnipresent one that could keep the masses by turns frightened and outraged – and thus docile and demanding of protection. What better than an “enemy” organised around a group already trained, armed, infiltrated and controlled by Western Intelligence? “al Qaeda” is Arabic for “the Base” – or database as, in its Western incarnation, it morphed to refer to the database of foreign (mainly Wahhabi and Sunni Arab) fighters prepared to harass the Russians in Afghanistan through the late 1980′s, then Chechnya in the 1990′s and a few years later the Serbs in the former Yugoslavia. ALL of these campaigns in unwitting service to – and furtherance of – that same AANIP. “al Qaeda” was thus the creation of the CIA and, thoroughly infiltrated manipulated and controlled, it remains so to this day. How can we be sure of this? – well the clincher, in the vast array of evidence that says so, lies in the name. Arabic, like English and most languages, has its collections of homonyms and it appears that “Toilet” (loo, khazi, WC, gents, john etc etc.) is a particularly populous one – especially since they have to cater for the Western fashion of sitting on a seat with a hole in it, rather than squatting. And guess what? “al-Qaeda” is one of them – and the seat-type Western one at that! So question: Can you imagine a group of terrorists styling themselves “The Red Toilet Faction”, “The Toilet Brigades”, “The Irish Republican Toilet” ? - Hmmm; me neither. It sticks out like the bulbous red backside of an Orangutan you might say – and sort of gives the game away. Of course no one outside the gullible western-propagandised sheeple are taken in by it, but that matters little to TPTB in the West. Those who can clearly see that the Emperor has no cloths and who understand the grossness of his deceptions, have neither vote nor voice and thus, so long as there are regular “terrorist” attacks to keep the Western Sheeple outraged and fearful, they can be safely ignored. Popular perceptions of the “grave risk to our way of life that terrorism (ie al-Qaeda) represents” must be carefully calibrated and, from the 1605 Gunpowder Plot, through the 1890′s “Walsall Bomb Plot” and latter-day “Operation Gladio” outrages, our security services have mastered the art to near perfection. I have taken to watching the BBC news occasionally again – strictly for its entertainment value you understand. It is a rare bulletin that does not include at least one of the range of standard-format rah rah pieces about our oh-so-necessary, just , and righteous wars; or the grave threat we face from the barbarian (or rather Muslim) terrorist hordes ranged against us. I have also taken to counting the number of “Branches” (Franchises might be a better term) of “The Toilet” (TT) we now need to fret about – TT in Iran; TT in Iraq; TT in Timbuktu – cave-space rental must be costing an arm-and-a-leg. I’m waiting patiently for TT on the moon. The latest of course is TT in the Yemen. Apropos the latest shock-horror episode of the toner-cartridge-bombs saga, I was watching Frank Gardner explaining it all on the BBC a few days ago. It was bloody hilarious – really entertaining. 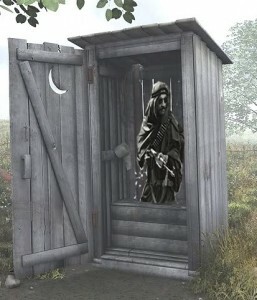 “The Toilet” was invoked no less than 9 times in a 3 minute slot with such gems as: “The Toilet in Yemen consists mainly of Toilet Operatives from Saudi Arabia” (and there was I thinking that it was Saudi that imported lowly immigrants to clean their khazis – you live and learn eh?). So next time you are forced to endure Mr Gardner, or any other MI5/6 stooge waxing lyrical about “al Qaeda in Iraq”, Afghanistan, Saudi, Yemen, Blackburn, Tunbridge Wells, etc etc. remember, everywhere has them! - and every time you hear that dreaded scary “AL-QAEDA!! !” word, just substitute the translation. You’ll begin to look forward to the news as a reliable source of hilarity. PS native Arabic speakers are cordially invited to correct me – or elaborate. adny on Who is arming the Libyan Rebels?